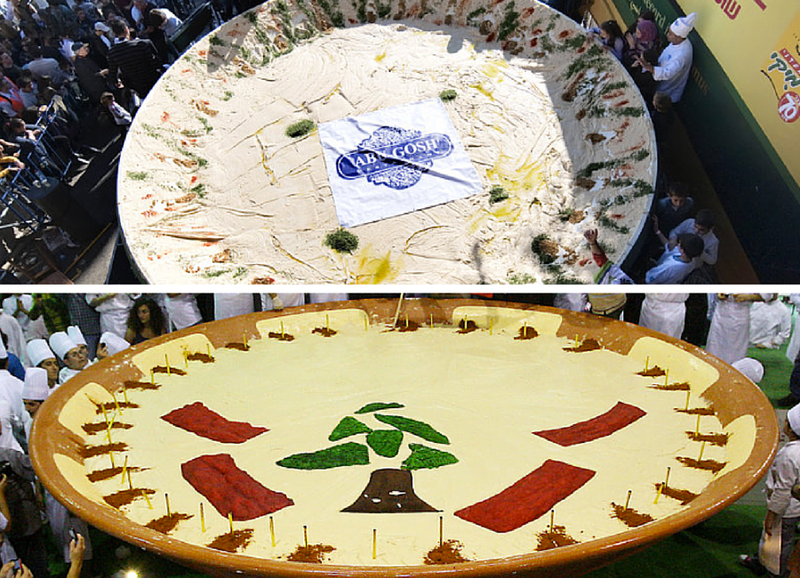 Above: The Arab-Israeli town of Abu Gosh’s 2010 vat of hummus, and a record-breaking Lebanese dish of hummus that holds the title for world’s largest serving of hummus. Everyone knows that hummus comes from the Middle East, but no one knows exactly where it was invented. While most hummus eaters are entirely at peace with that fact, happily noshing on hummus and pita, some are eager to prove once and for all that this beloved chickpea spread is theirs. According to NPR, this is the concept that sparked the “The Hummus Wars,” which began in 2009 when Lebanon’s minister of tourism, Fadi Abboud, set out to settle the dispute by gathering Lebanese chefs to make the world’s largest vat of hummus. The winning batch weighed more than 4,532 pounds. When an Arab-Israeli restaurant owner, Jawdat Ibrahim, got wind of Lebanon’s claim to hummus, he responded with his town of Abu Gosh to make his own record-breaking batch of hummus. “Hummus is for everybody,” he told NPR. With that, an Israeli town reclaimed the World Record Title in January 2010. Just five months later, the title went back to Lebanon, where chefs made 23,042 pounds of hummus, served in what became the world’s largest ceramic plate. During this time, Lebanon sought to register hummus with the European Union, obtaining all rights of the use of the word “hummus,” like France’s ownership of champagne or Greece’s claim to feta cheese. If you think this is missing the point, we’re with you. Hummus, and many different variations of chickpeas, garlic, lemon, and sesame seeds, were made by people everywhere from Turkey to Yemen for more than 1,000 years. According to Wikipedia, the first mention of what we recognize today as hummus comes from 12th-century Egypt. Hummus became popular in Israel in the 1950s, when Palestinians introduced hummus to Israeli immigrants from Europe, reported NPR. By the late 1950s, it was standard fare in the Israeli army’s mess halls. Since then, Sephardic Jews, Arab Israelis, and Israelis of all backgrounds have been making hummus a symbol that unites them all.